Saraki, Dogara To Escape Impeachment With Support Of Angry APC Lawmakers? 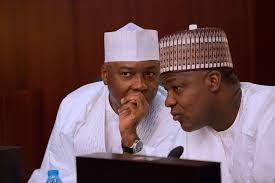 Some senators and members of the House Representatives have said Senate President Bukola Saraki and the Speaker of the House, Mr. Yakubu Dogara, will survive the impeachment plot of the APC leadership against them as a result of the crises rocking the ruling party’s primaries. They believed there would be a realignment of forces in the National Assembly as the federal lawmakers resume from recess on Tuesday, which would make it difficult for the APC legislators to muster the required number to remove Saraki and Dogara. The lawmakers explained that most of the supporters of President Muhammadu Buhari, who wanted Saraki and Dogara removed, had lost their bid to return to the National Assembly during the APC primaries. Some of the lawmakers, who spoke on and off the record, told The Punch that two factors would, on resumption of the legislature, determine the fate of Saraki and Dogara, who had defected to the opposition Peoples Democratic Party in July and September respectively. A member, who spoke on condition of anonymity, said, “One of the factors is if the APC has any foolproof strategy to plot the removal of the presiding officers, considering the fact that in the final analysis, it boils down to the game of two-thirds majority. “The second is the outcome of the primaries. Will everyone, who was in either the APC or the PDP prior to the primaries, still remain in the parties? Some members confided in The Punch that if the APC retained its majority lead and mounted pressure on members to begin impeachment proceedings, they might comply just to please the party. Atunwa, a member of the PDP, also noted that many of the top guns the APC wanted to use as the arrowheads of the anti-Saraki or Dogara fight, were having difficulties getting return tickets smoothly. He added, “If the APC, and by extension, Mr President’s known supporters don’t seem to have his backing in getting their tickets, will they come back to talk about impeachment? “In Ogun State, the governor is helpless; in Adamawa State, the governor is facing a tough battle. Senator Ovie Omo-Agege has crisis in Delta State and in Nasarawa State, Senator Abdullahi Adamu is gasping for breath and so on. But, an APC member from Lagos State, Mr. Babajimi Benson, informed The Punch that members would file behind the party on whatever directive it gave to them on resumption. Benson stated, “It depends on what the party wants us to do. Like I have always said, the party should give us direction. We are still conducting our primaries. After the primaries, we will wait for what the party says. Speaking with The Punch on the phone on Friday, Senator Rafiu Ibrahim (Kwara South), who has been speaking for senators led by Saraki to the PDP, said those calling for the Senate President’s removal had backed down. According to Ibrahim, some of the APC lawmakers calling for Saraki and Dogara’s sacking or impeachment have lost the party’s tickets for their reelection. This, he said, would lower their morale in the leadership tussle. The Secretary of the Parliamentary Support Group, a body of anti-Saraki lawmakers in the National Assembly loyal to Buhari, Senator Ovie Omo-Agege, declined to comment on whether the impeachment threats would be carried out on resumption. “I can’t talk about resumption now, please. We are doing primaries,” Omo-Agege said.